Most of the musicians that recorded and performed with Miles Davis during his early explorations into electric instrumentation went on to form bands of their own. Of these groups intent on further exploring the new ground that Miles was forging into, few were as adept or as influential as the Mahavishnu Orchestra, a globally diverse group formed by legendary guitarist John McLaughlin. Combining the improvisational elements of jazz with the volume and energy of rock music, the group—who also brought elements of Far Eastern music, R&B, classical, and occasionally even country to the table—created music that was often intricate and complex, performed by musicians whose virtuosity thrilled audiences and critics alike. The group had a firm grip on dynamics and was equally adept at dense, aggressive flights of musical intensity as they were at creating moments of impassioned, spiritual contemplation. The band started out in 1971, and they released their first LP The Inner Mounting Flame later that year. Led by McLaughlin, the group was rounded out by Rick Laird (bass), Billy Cobham (drums, percussion), Jan Hammer (organ, keyboards), and Jerry Goodman (violin). The group's debut was eight tracks of a tasty amalgam of jazz and progressive rock, which hit No. 11 on the Billboard Jazz Albums charts. It was followed up by another successful album, 1973's Birds of Fire. These albums would prove to be the most well-known of their career. 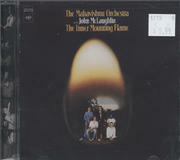 During the creation of their third album, internal tensions came to a boil, leading McLaughlin to effectively break up the band. McLaughlin carried on with an entirely new roster, and their 1974 album, Apocalypse, was not as successful as their previous work. McLaughlin continued to toil on, and after even more lineup changes, the group finally split in 1976. Though the band would regroup in 1983, they only put out two albums, none of which had the profound impact that their earlier material had. In his typical style, McLaughlin quickly moved on and continues to make solo albums to this day. His virtuosic progressive jazz playing has made him one of the most influential players of the 20th century. He continues to tour all over the world, usually with small jazz-fusion groups. As for the other original members, Laird toured with Chick Corea and ended up becoming a well-respected concert photographer. Cobham—a world-renowned drummer in his own right—has released over 25 solo albums and has worked with artists like Jack Bruce of Cream, John Patitucci, and Carlos Santana. Hammer, the keyboardist from Prague, went on to become famous for composing scores for film and TV. He's also featured on six Jeff Beck albums, including 1977's famous live LP Jeff Beck with the Jan Hammer Group Live. Goodman went on to become an accomplished studio musician, notably playing on the last four albums from ex-Dream Theater keyboardist Derek Sherinian and on the Dream Theater disc Black Clouds and Silver Linings.